An oval mother-of-pearl brooch with a gold filigree mount. 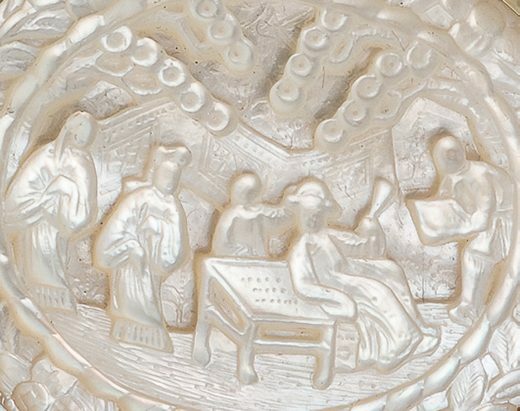 The convex top is carved in relief with a landscape setting, in which a lady holding a fan leans on a square table with several other figures standing around her. The scene is contained in an oval cartouche, which is surrounded by a band of tendrils. The stepped and slopped base has a rope pattern and wavy decoration on the sides. A long pin, fastened in a tube hinge is horizontally placed across the back of the brooch. The shells of the various molluscs with which the tropical seas off the Guangdong coastline abounded is the most likely source of this material. It was utilised in the Guangdong carving workshops, including in this charming brooch. 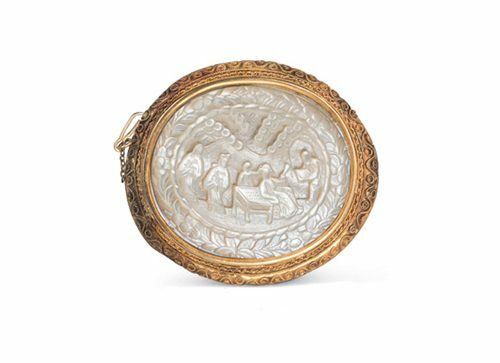 Mother-of-pearl was commonly used to produce game counters and jewellery, which became fashionable in 18th century Europe, and this brooch was made for the European market. The history of wearing brooches in Europe can be traced back to the Bronze Age. Natural materials such as bone, shell, wood and carved stone were first used to decorate brooches, and precious, higher quality metals were applied as civilisation progressed. Most brooches used C clasps up until about 1900, and from about 1850 to around 1910 almost all hinges on brooches and pins were tube hinges.